These savory delights are perfect for a tasty treat anytime – breakfast , lunch or a snack. Be sure to use fresh thyme in this recipe; it is delicious with the apples and honey. If available, due to it’s butter content, we recommend using Dufour Puff Pastry. Peel and core the apples. Cut into 1/4″ dice to make 1 generous cup. Melt the butter in a large sauté pan over medium heat. When hot and bubbling stir in the honey. Cook for one minute to melt the honey then add the apples and thyme. Sprinkle a small pinch of salt over the apples. Cook the apples over medium heat until they release their juices, then stir until all the liquid is absorbed and the edges of the apples have slightly browned. Remove from the heat and let the apples cool to room temperature. Slice the brie into eight even slices. On a lightly floured surface, roll out the Puff Pastry to form a 11″x16″ piece of dough. Cut into eight pieces, 5-1/2″x4″. 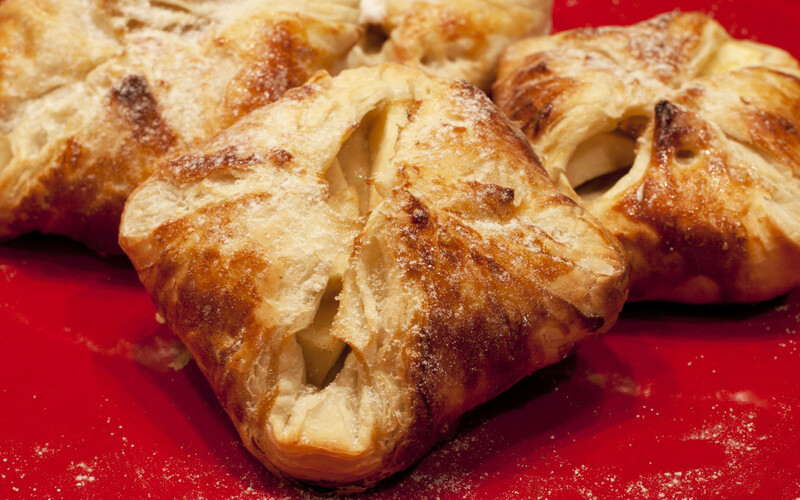 Place the cheese in the center of the puff pastry and top with 1/8 of the apple mixture. Fold the dough over to close. Press lightly on the dough to seal it. Repeat with the other 7 pieces of dough until you have 8 total. Using a pastry brush, lightly baste the top of each pastry with cream. Sprinkle with a small pinch of salt. Place on a parchment lined sheet pan, cover with plastic cling wrap and refrigerate for 2 hours or overnight. When ready to bake, preheat the oven to 400 degrees. When the oven is ready remove from the refrigerator, remove the plastic cling wrap, and bake for 20-25 minutes. Cool slightly on a backing rack, can be served warm or at room temperature.